Should I Turn My Computer Off at Night? - Ask Leo! Should I Turn My Computer Off at Night? Depending on your usage, turning your computer off at night might be appropriate. But is it actually saving energy? In the long run, it's hard to say. A friend of mine told me it is better to not turn off my desktop computer every night, instead to turn it off every few nights and just put it on standby every night. I work from home and I use my computer every day. Is it really better to not turn it off every night? I have a four-year-old dell Desktop with one of those old clunky monitors. Is putting it on standby saving as much power as turning it off? Also, does turning the computer on and off affect it negatively? The issue isn’t as simple as you might think; there’s no single answer to this perennial question. There are two issues at play here: the power used by a computer left running 24 hours a day, and the stress on hardware components being repeatedly turned off and on. Power consumption is the easier question. In most cases, standby is almost as good as turning your computer off completely. The computer uses a little power to keep itself ready for use, but components using the majority of the power, like spinning hard drives or display devices, are turned off. 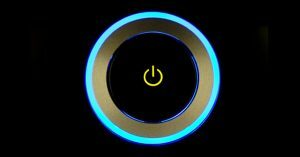 Before you decide that standby or power-off is what you want to do to save electricity, it’s important to realize that your computer may already be taking steps on its own to minimize power usage when you’re not using it. Many individual components go into the equivalent of standby all on their own if they’re not used for some period of time. Hard drives may turn off after some period of inactivity. Screensavers eventually turn video displays off. Even a wireless mouse or keyboard may assume a low-power state when they havn’t been used for a while. So, it’s quite possible that, depending on your computer, simply walking away reduces the amount of power being used. There is an argument that says leaving a component on continuously is less stressful than turning it on and off repeatedly. While you may save power while the device is off, the stress of heating up and cooling down when starting and stopping can contribute to earlier failure and required replacement. The argument is that the cost (in terms of purchase price and the environmental impact of replacing a broken device) is so high that in the long run, it would have been more cost effective to simply leave it on all the time. The counter argument is that most components are built with this in mind. As I mentioned, many components turn themselves off after some period of inactivity, whether you tell them to or not. The devices are built to power cycle fairly frequently. And in almost all cases, devices are already lasting longer than we need them. Devices are most commonly replaced not because they fail, but because newer and more powerful devices are purchased. As you can see, there’s no simple answer. There are arguments for both approaches. My approach is to ignore all of the arguments above, as they more or less cancel each other out. Instead, I make the decision based on how I use my computers. It’s no surprise that I am a heavy computer user, and for me, the answer is to leave almost all of my equipment running 24 hours a day. Not only does that keep everything ready and running for my use, it allows automated processes like updates and backups to happen in the wee hours of the night when I’m asleep. My expectation is that an average user who uses their computer a few hours a day would most likely turn it off, or put it into standby, when it’s not going to be used for a few hours or more. That’s simply to minimize power use. It’s also not a big deal if you don’t. If you use it longer, perhaps you leave it on all the time. Again, no big deal. If there’s anything I might consider a tipping point in the decision, it’s backups. If leaving your computer on all the time allows you to automate the process and start taking backups where you otherwise would not, or would forget, then in my opinion, it’s totally worth it. 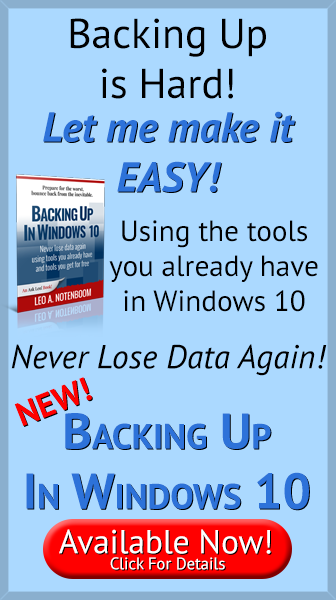 Will backups run if my PC asks for a password? - Scheduling regular backups is an important step in your overall backup strategy. But they do have to run when your computer is on and accessible. Will a Scheduled Backup Wake My Machine Up If It’s Sleeping? - Some backup programs can wake up a sleeping machine, but there are still things that could go wrong and cause a backup to fail. How Do I Keep My Computer from Being Hacked at Night? - Hacking attempts happen all day long. You really need to protect yourself 24/7. Fortunately, there are several steps that you can take to stay safe. 1: Surprisingly, not quite true on some machines. Even when you turn the power completely off, there are often components that remain powered to some degree. Only pulling the power plug prevents this tiny trickle of electricity from being used if it is on your specific machine. « Previous post: Why Doesn’t Blocking Email Senders Work? There’s also “hibernate mode”. This saves the state of the computer (as does “standby”), but it saves it to the hard drive, and actually does power off. Powering on then restores the state from the hard drive, rather than doing a “full” boot. However, I have numerous programs running, and windows just where I like them, so I like the fact that they’re where I left them with hibernate. You never mentioned anything about how not rebooting the machine properly at least once every few days, software related problems start occurring such as ‘junk’ building up and the OS being more likely to corrupt itself. As for a further question, can I computer become infected by being connected to the internet during standby? Nope, with your machine in standby your network connection is inactive. My computer is always On since 3 years at least, except about 15 days per years my holiday. I’ve been leaving my machines on 24/7 for years. This is due largely to my own impatience and a degree of laziness rather than for any technical reason: I hate to wait for it to boot up! That said, I’ve never experienced a problem related to or as a result of leaving them on. So, as Leo the wise has indicated, it is largely a matter of personal preference. I would recommend keeping the machine clean (clear cache, etc.) and an occasional reboot. My machines seem happier when I do this than not. If I leave my computer on for long periods of time, it seems to “load up” on me. Everything slows down, things sometimes quit working. I have a Dell E521 with Vista on it (bought new this past summer). In fact I use yahoo messenger and it freezes up on me all the time. It gets better when I shut the machine off and restart it. But I always shut mine off at night, as I’ve already had 3 fans burn out on my old computers. probably have a dead CMOS battery. That can be replaced. My Gateway computer is 7 years old, it has windows XP , lately it has started to put itself in standby when I am using it and I can’t bring it out. I have to turn off all power and wait a long time before it will come up again then, it closes itself down again. Its most likely a setting in your power options in your settings..NOT to be vague but the power up on usb might be turned off..play around with it and see if that helps. You might want to check your power settings to ensure that it is not set to go into stanby mode ever so many minutes. When I return to work in the mornings, my computer does not boot up unless I manually turn it off, then turn it back on. I don’t shut down my computer when I leave in the evenings. Normally, it hibernates, and I come in and press the space bar, and its back up. Now however, the blue light is on, and when I press the space bar, I can hear the computer “roar”.. but nothing comes up on my monitor unless I turn it off, and then turn it back on…. What should I do?? please can you tell me how to turn off power safe mode on my computer.i try boothing my computer and all i see is a black screen telling me my power safe mode is on. what should i do?i was using a friend’s computer when all of a suddenly it went off without any warning.i was able to reboot the computer but everything on the desktop as become faint which makes difficult reading or seeing on the desktop.what can i do.really need help. Surely you should turn off your modem when not in use to prevent high tech hackers from getting in the back door. Our local police claim they can access info about you while you are turned on. My computers are on 24×7. The more important thing is to have a good firewall, which will prevent exactly the type of access you describe. It can be a simple as a NAT router. An important factor is the price of electricity in your location. In the Netherlands we pay an additional environment tax of about 250% and then 19% sales tax on top of that. Together with meter rent and electricity transport costs that brings the total to about 25 Euro-cents per kWh. Most of the updates require your system to restart after instolation and as you have mentioned earlier they are could be as frequent as few per day. So the wear and tear factor is unavoidable in that perspective however I belive restarting is beneficial for the system anyway am I confused or it is? It varies a great deal on how you use your computer. I have my main machines reboot overnight. There’s really no additional wear and tear to doing so. powering down the computer stress critical components such as the CPU and memory.. so does this practice is more waste? That’s actually discussed in the article you just commented on. As Leo says, it depends. It depends on a myriad of things…..things as basic/minuscule as “what is my time worth”, assuming you have to, perhaps, walk to another floor of the house to turn off your server……or, “how many people in the family use the network…and at what times of day”. It definitely can’t be a one-size-fits-all answer. Your article was very helpful but my problem is that My Dell Dimension E510 has just developed early stages of the dreaded flashing amber light on startup which effects powering up. At the moment I get away with massaging the start button for about 5mins but for how long! It starts up OK from standby so my dilema is will I be causing less stress by leaving permanently on standby or risk complete failure by stwithing off every night if and when my existing fault develops further? replaced due to lightning striking the power line. when there is a power failure. First hibernation IMHO is a very good thing which works 98% of the time, however I’ve had a few times (in my 20+ years in IT) when computers was completely lost, so I’m staying away of it. Also, in one of comments before was mention of degradation of software if computer is always on. This maybe related to a memory leak – ( Because they can exhaust available system memory as an application runs, memory leaks are often the cause of or a contributing factor to software aging). AFAIK when you are open app and then close not all the used memory returned to the OS, so eventually your RAM is runs out. The quick solution to this problem is to restart your computer daily. I used to use hibernation all the time until I got a computer with an SSD. Now it starts up in about half a minute, faster than my previous machine with hibernation. I set my backup program to shut down the machine after the backup. Actually if you truly close an app, Windows will release all memory it allocated, whether the app explicitly frees it or not. More common memory leak issues arise from apps that are never closed, like background programs, tray apps, and the like. Browsers seem especially prone of late, so closing your browser completely can often alleviate a lot. But, indeed, rebooting every so often addresses a multitude of issues. I turn off my computer because I have had to replace the computer power supply when it fails from continuous use. Other options such as hibernate will do the same thing, I just like to keep things simple. But whatever you choose, make sure either to turn it off or that you operating sytem’s power settings automatically shut down components which wear out, the power supply in particular. No-one seems to have mentioned that it is possible for a computer to catch fire, as my wife’s PC suddenly decided to do. Luckily we were around smelled burning insulation and switched off. We now switch off whenever we leave the house or head for bed. A properly maintained computer, with proper ventilation, should never catch fire on its own. Regarding comments on sleep mode vs powerdown, there was no discussion about impending thunderstorms. I turn off my desktop pc and unplug its external UPS from the wall when thunderstorms are predicted in order to protect the desktop pc and its UPS. How much built in protection do desktop pcs and UPS have now days from electrical spikes and drops? Recommendations when thunderstorms are forecast for your area are most appreciated. Either a good UPS (they do protect), or turn it off and unplug if your area is prone to severe thunderstorms. will handle, I live in FLa, I have a surge protector in wall outlets..plugs into can run 2 outlwts as 2 outlets or as much as 2 into four outlets..the UPS gets plugged into that so surge at outlet, surge protect at UPS if any gets past the houses main line. The REAL danger is in the CABLE for your cable internet, thats usually not surge protected.. I hibernate my desktop each night after a little utility work (backup, virus scan etc). The BIOS has a function to turn it on which happens at 6:30am. One night a week a full backup is done and another a deep virus scan occurs. The DT is plugged in to special power strip that senses power is below a thresh hold and suts off the printer. On my laptop, which has a solid state drive, I do not hibernate as per recommendation of the manufacturer. I just shut it down. It only takes 55 seconds to full usage, similar to return from hibernation times. If you can hear a fan running in a sleeping computer, it is accemulating dust. Shut it down instead. In My experience it seems best to keep a PC on 24/7, Things do go into low power sure but also while Idle the Computer can run tasks that will not or if do run can impact your use like schenduled quick scans by ones anti-virius and other tasks. Leaving on 24/7 allows things to be done while “idle” You can prevent some things from occurring like automatic deleting suspicious files by setting to just quarantine and checking that for false positives when on the PC later. so leaving it on 24/7 allows such in idle time where if only on when your on the PC your going to have to run some tasks or they will run in background while your doing things slowing up the system. There is also the aspect of that in my view, the GREATEST stress hits electronics at a COLD start which is why often its “it was fine and working last night when i turned it off but I try now to turn it on and it will not start up!” Happens. The extra stress a COLD component takes can in a microsecond blow the HDD or Motherboard or..and “hey its not working etc” If Leave on 24/7 even if a HDD say goes into a suspended state, etc it remains WARM the systems still running even in a lower power state and remaining Warm.. not dead cold as it will be in Morning or Next evening after you complete shout it off. I will say also if you go the 24/7 on route..have a UPS hooked in so no power blips messes up things and causes PC to reboot and be waiting for you to restart it up..
As Far as hackers…they are always about and if worried.. Its as likely get hacked when online as if idle but having not only a hardware firewall using a router but also a Software firewall and security suit addds a defense layer if they get past your router. Only fools will use a PC with no security suite, no software firewall and direct connected modem to PC these days. without any need to complete re-install windows nor replace any hardware. Everybody I know (I live in Holland) turn their computer off after usage. Has little to nothing to do about footprint. If you’re shortening the life of your computer, for example, you’ll have to replace it sooner and thus are contributing to electronics waste. There are no simple (nor smug) answers here. As a rule, I turn off my computer whenever I know I won’t use it again for more than 24 hours and perform a restart if a computer is running for seven days. In my company there is a ruling that we have to turn off computers at night by remote commands to preserve electricity thus environment. I try to combat that mainly due to issues mentioned in the article. There is also a data loss possibility. Some workers leave some programs running after work so they compute the data – identyfing those machines and excluding them from powering off is a heavy task that not always works and leads to occasional business interruption. A tedious work and a waste of time imo that I’d prefer to invest in other areas. But people believe that it’s actually serving well the environment. Well, I do stand for that, I just don’t believe it works well in such case. I have two computers: a desktop and a laptop. The desktop is on all the time. The only time I turn it off is when leaving the house on a vacation or just will be gone for more than a couple of days. The main reason for this is so I can start using it when I sit down. HOWEVER, while it’s idle, it does background tasks, one of which is a weekly backup of the hard drive. My data is backed up separately, but that’s a different issue. The MAIN background task is World Community Grid. This allows my computer to remain busy when I’m not using it, and it can be configured to run only when the computer is not in use. I also have a screen saver. The screen savers rotate, and one of them is World Community Grid, which tells me what it’s working on. I don’t fully understand what the computer is doing, but it’s DOING something. This way, the electricity is not being wasted. My laptop, however, is only on when I’m using it. The downside is that updates don’t run in the background. World Community Grid isn’t installed on it, and I won’t install it, because it’s the portable computer that I use when not at home. I also have to wait until it powers up before I can use it, which can take a few minutes. My work leaves the computers on so updates can be done at night when we’re not there. We just make sure all main programs are closed when we close. Remember that’s there advantages and DISadvantages for both sides. As mentioned in the article, do the one that’s best for you. Another quality of life reason is the noise that the computer makes. For a student like me, my computer is in my bedroom, so leaving it on all night would be very annoying because of the running fan and the lights from my peripheral devices (LED keyboard, mouse and headset). For those reasons alone, shutting down (or at least sleeping) every night just makes sense. Something to consider on the pros and cons list. It is reassuring though that there seems to be virtually no difference in hardware lifespan from a single shutdown cycle each night. All of the above information was very helpful ie its ok to shut down my HP-20- ALL IN ONE when I’m done with a session.